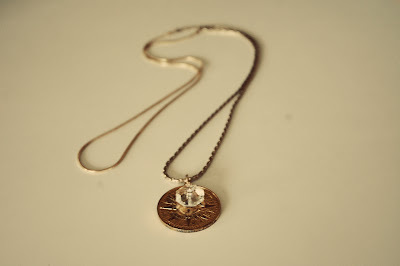 This week's giveaway is from Kathryn Wolle of Faithfully Yours.... Kathryn is giving away this vintage necklace. Kathryn created this unique necklace that has been refashioned from two separate vintage gold necklaces. The pendant is a gold “doubloon” found in a box of antique jewelry and a small crystal from an antique chandelier reminiscent of a pirate’s treasure. The necklace measures 18 inches long and the pendant measures 1 ¼ inches. Add a touch of flash and whimsy to your next outfit! 7. Become a Facebook Fan of Faithfully Yours…. Comment back here with your Facebook name. Existing fans just leave your Facebook name here. 8. Follow Faithfully Yours… on Twitter. Comment back here with your Twitter link. Existing followers just leave your Twitter link here. 9. Follow Kathryn's blog. Leave a comment here letting us know you are a follower. If you are already a follower, leave a comment anyway, as each comment is an entry. 10. Contest ends Saturday, February 11, at 12:00 noon Central. One winner will be chosen by Random.org. Fun Friday Finds for a Night in! This week's giveaway is from Rita of HandemadeBits4U. 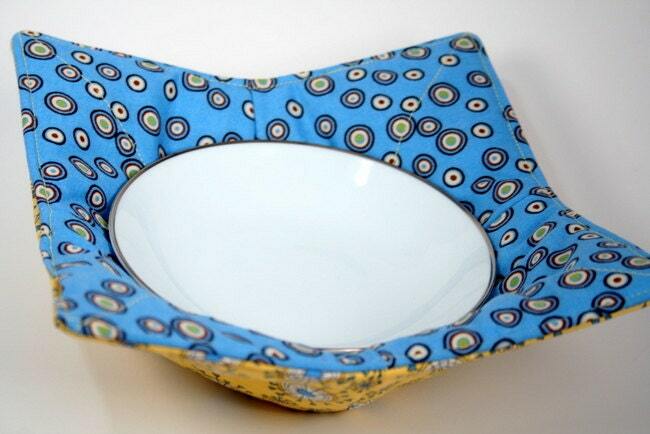 She is giving away a pair of these neat Microwave Bowl Potholders. Warming up some soup? Making oatmeal? Having some leftovers for lunch or dinner? Are you tired of wrestling those hot bowls/containers from the microwave? Here's a new kind of microwave potholder - a Microwave Bowl Holder that will make this task much easier on the hands!. Like ice cream but would prefer not to get cold hands while eating? Just put the bowl of ice cream (or perhaps the ice cream container itself) in the bowl and enjoy your ice cream without get chilly fingers! 7. Follow Rita's blog. Leave a comment here letting us know you are a follower. If you are already a follower, leave a comment anyway, as each comment is an entry. 9. Become a Facebook Fan of HandemadeBits4U. Comment back here with your Facebook name. Existing fans just leave your Facebook name here. Contest ends Saturday, February 4, at 12:00 noon Central. One winner will be chosen by Random.org. Fun Friday Finds — Send in the Dragons! It's Chinese New Year on Monday, ushering in the Year of the Dragon, an auspicious occasion for all. 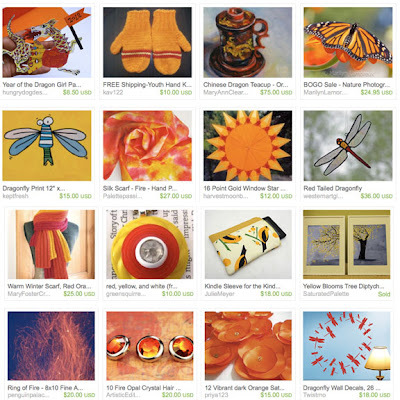 Minnesota's Etsians welcome the dragon with things fiery and dragony (and dragonfly) and lots of toasty reds and gold and orange! This week's giveaway is from Julie of Inviting Play. 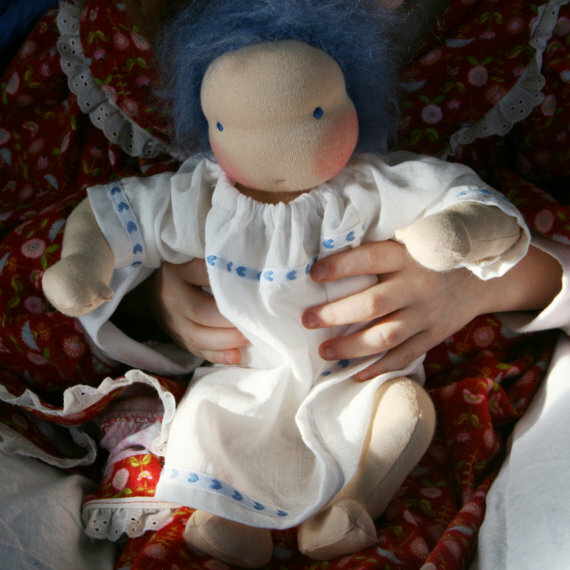 Julie is giving away this Waldorf Baby Doll. Julie Colby of Inviting Play created this 12" Waldorf Baby Doll. It was handmade by Julie by using traditional methods and all natural materials. The features of her dolls are kept simple and neutral. All of Julie's dolls are stuffed with Minnesota wool and made with natural fibers such as cotton, wool, mohair, and alpaca. Each doll is completely unique and one of a kind. This very sweet baby has bent baby shaped limbs, a belly button, a cotton velour diaper, wool felt slippers, a cotton linen dress with beautiful cotton Swedish trim, a soft cloud of blue mohair for hair that can be gently brushed and finger styled, and a velour hat. All of the doll's clothes come off and are constructed with children in mind so that the doll can be dressed easily. This is the perfect sized baby for 1 - 5 year old children. Children under three should be supervised as needed because mohair sheds and is not good to eat. 7. Become a Facebook Fan of Inviting Play. Comment back here with your Facebook name. Existing fans just leave your Facebook name here. 8. Contest ends Saturday, January 28, at 12:00 noon Central. One winner will be chosen by Random.org. I love January....Not! But I really do love our HandmadeMN team on Etsy. 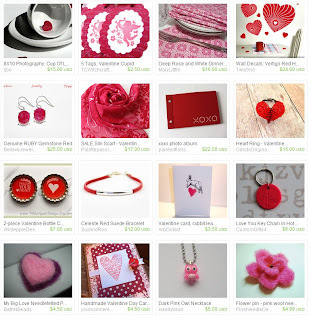 Show your love by checking out these great handmade items. December was a busy month for many of us at HandmadeMN. So busy, in fact, that only one of us found time to submit an entry to our monthly challenge. So no voting this month. 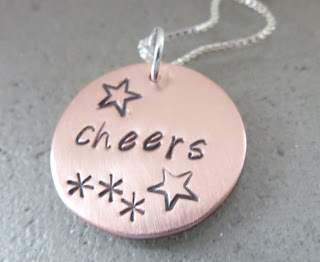 Please take the time though to congratulate Toni of Wild Dog Studio for her copper charm necklace submission! Cheers to you Toni! 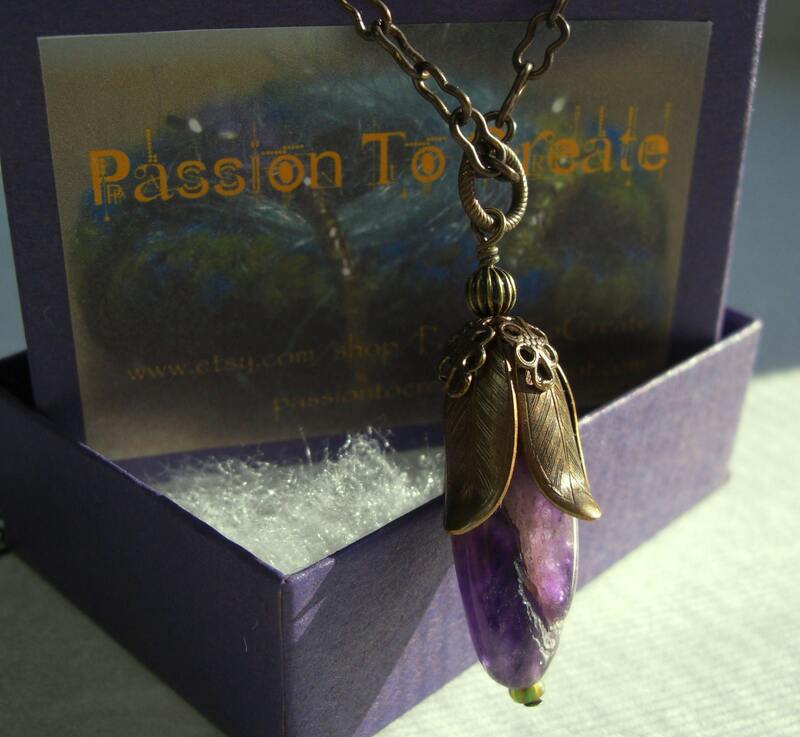 This week's giveaway is from BarbAnn at Passion To Create. She is giving away this fun necklace. Amethyst is the color that you see in the sky as twilight transitions into night. This crystal is the most recommended stone for stress relief. A beautiful violet purple aborigine teardrop shaped stone crowns this piece. 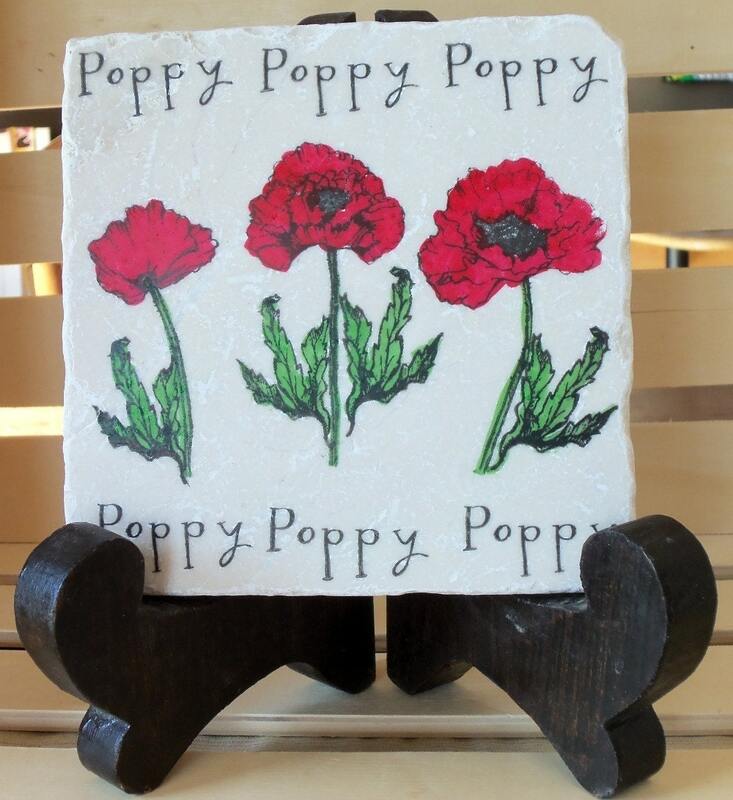 It is a gorgeous stone with colors ranging from white to dark purple markings throughout. The stone blooms out of antique brass magnolia leaves. It is a comfortable and well balanced piece. Just seeing the beauty of this stone will calm you. Stone pendant is hung from antique brass chain 18” long with a hook closure. The pendant itself is 1 1/2" long. 7. Follow BarbAnn's blog. Leave a comment here letting us know you are a follower. If you are already a follower, leave a comment anyway, as each comment is an entry. Contest ends Saturday, January 21, at 12:00 noon Central. One winner will be chosen by Random.org. Fun Friday Finds ~ Finally Winter! The chill is upon us, folks! Stay warm! Happy New Year, everyone! I'm going to ring in the new year with a salute to one of my favorite Etsy shops and fellow HandmadeMN member, My Little Chickadee Creations. 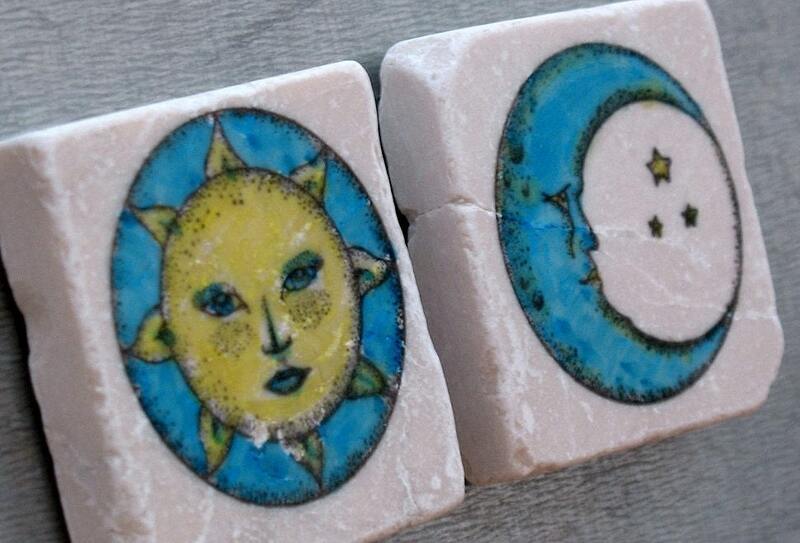 Ellie has a shop filled with hand-stamped travertine tiles. 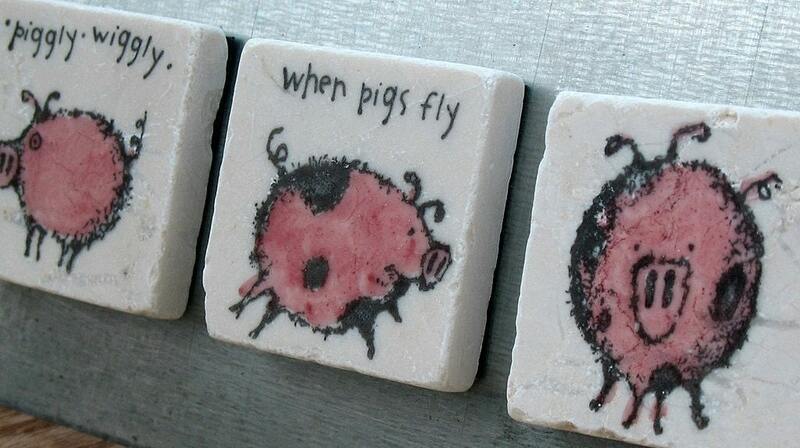 These tiles are then made into magnets, coasters, wedding/party favors, and more. I love the colors used for the images, and the images themselves are so wonderful too. The variety of products in this shop is astounding. My Little Chickadee Creations has everyone in mind so you're sure to find something that suits you to a tee. 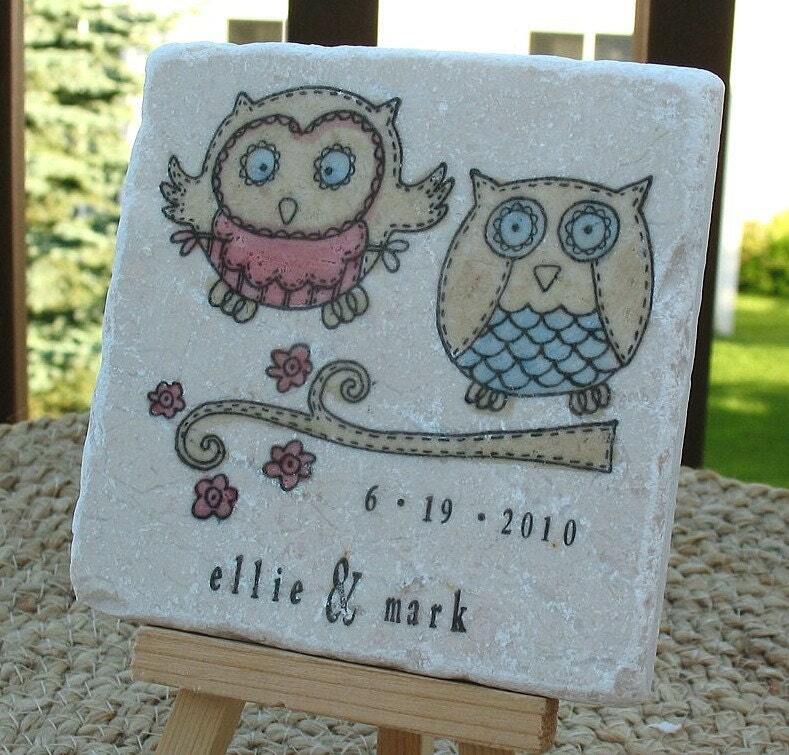 My Little Chickadee Creations is a really fun shop with a ton of things to offer. The shop has been highly recommended by previous buyers and Ellie will make sure you're a satisfied customer too. Today we are getting to know Gilda from A Handmade Princess who lives in Minneapolis. What do you make and why? I knit. And knit and knit and knit. Anytime an idea pops up in my head, I get on it. I make purses, cowls, hats, mitts, baby clothes, baby gift sets, and sometimes I mix knitting with sewing to create cute hippy tanks & dresses. Where do you do your making? With knitting, I can carry it along with me so I can keep my hands busy anywhere; in the doctor’s office, at school functions, in the movie theater, and the list goes on. What is your favorite part of the process or a favorite technique? Buying the yarn. No, seriously. It is so exciting to buy this ball of material and know that it will turn into something awesome that I made with my own two hands. Best feeling ever. Deciding on the actual material is the hardest. Shall I work with wool, alpaca, silk, or cotton with this project? I think alpaca is my favorite to work with - it is soooo soft (but expensive)! Guilty: I am a yarn hoarder. This is really lazy of me, but I love lace work the best, because it seems to go the fastest. My second favorite is color work, because you can come up with literally any design you want and incorporate it into your knitting. So, really, two fancy skills thrown into one project. Tell us something else we don't know. I’m in a knitting group. We meet every week (mostly) at a local coffee shop or cafe and knit and chat. Knitting is so collaborative. Have you checked out Ravelry? (www.ravelry.com) (I’m Gilda Knits on there if you want to be my friend) I design & sell my own patterns now. Shop Local! 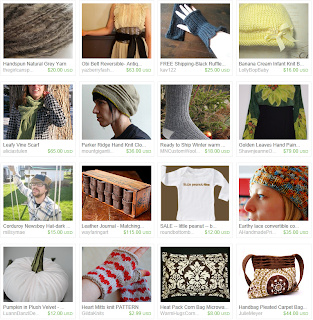 Support Your 2012 HandmadeMN Artists! August 25-26 10 a.m.-5 p.m.
Saturday, November 3, 2012 10:00 a.m. - 4:00 p.m. This week's giveaway is from Kate of Knits in Class. 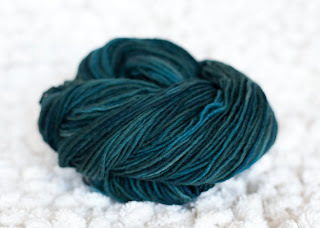 Kate is giving away this Merino wool yarn. Kate McCreight of Knits in Class is giving away this cozy single ply hand dyed Merino wool yarn is a delight to work with. Lofty and soft, it is the perfect choice for anything you can imagine. 225 yards, 100% merino wool, knit on US 7-9. 5. Follow Kate on her Knits in Class Fiber Studio blog. Leave a comment here letting us know you are a follower. If you are already a follower, leave a comment anyway, as each comment is an entry. 7. Follow Knits in Class on twitter.Comment back here with your Twitter link. Existing followers just leave your Twitter link here. 9. Become a Facebook Fan of Knits in Class. Comment back here with your Facebook name. Existing fans just leave your Facebook name here. 10. Contest ends Saturday, January 14, at 12:00 noon Central. One winner will be chosen by Random.org.